viaLibri ~ Prospectus for A Digest of the Laws and Resolutions of Congress. Legal Publishing; Bennett, Clement W.
Prospectus for A Digest of the Laws and Resolutions of Congress. 1854 - 1854 Circular Advertising a Handbook on Veterans Benefits [Legal Publishing]. 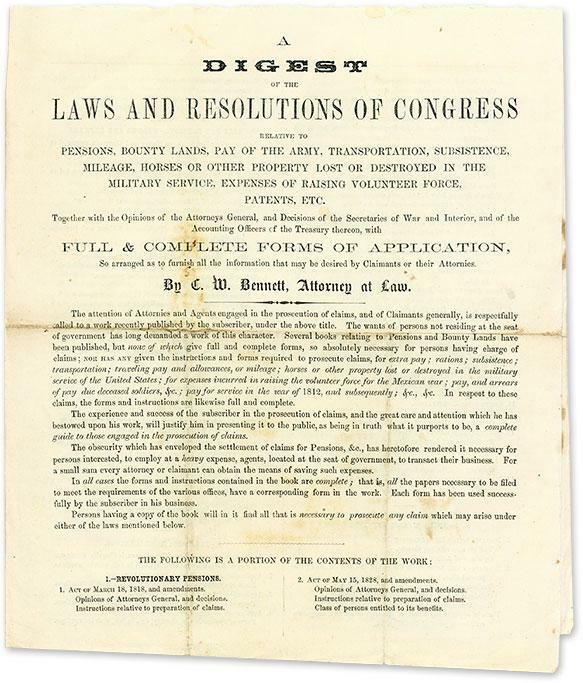 Bennett, C[lement] W. [Prospectus for A Digest of the Laws and Resolutions of Congress Relative to Pensions, Bounty Lands, Pay of the Army, Mileage, Horses or Other Property Lost or Destroyed in the Military Service, Expenses of Volunteer Force, Patents, Etc. Together with the Opinions of the Attorneys General and Decisions of the Secretaries of War and Interior, And of the Accounting Officers of the Treasury Thereon, With Full and Complete Forms of Application, So Arranged as to Furnish All the Information that may be Desired by Claimants or Their Attorneys]. [Washington, DC, c. 1854]. pp. Quarto (9-1/2" x 8"). Single leaf folded to form bifolium. Moderate toning, bottom edge of second leaf (pp. 3-4) trimmed closely (without loss to text), two vertical and one horizontal fold lines, a few minor spots. $250. * This prospectus offers an overview of the book, a summary of its chapters and ordering information. Bennett was an attorney in Washington, DC. Published in 1854, this self-published book has an imprint reading: "Washington: Holman, Gray & Co., Printers, Corner Centre and White Streets, N.Y." No copies of this circular listed on OCLC.